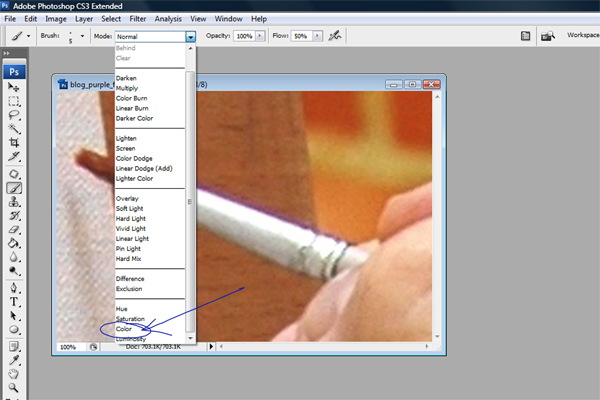 Click on the “Brush Tool” on the left sidebar of tools (see photo below). Choose the word “Color” from the drop down “Mode” menu (see picture below). 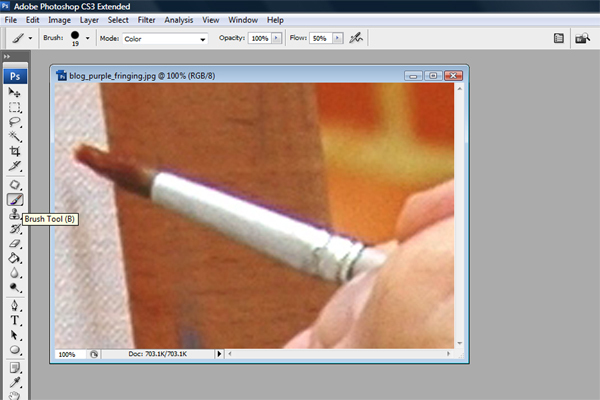 Select appropriate brush size for the area you’re working with and change your view to 200% or more in the bottom left box, just below the image. 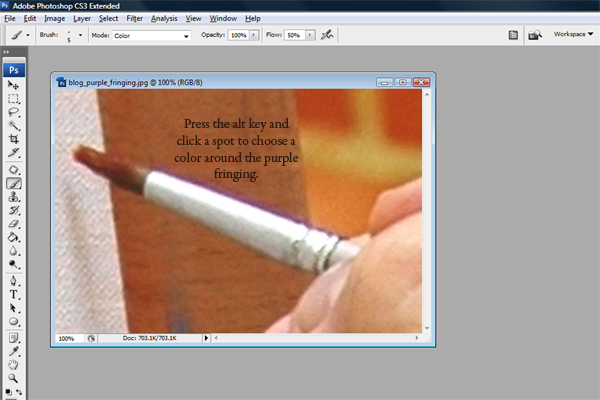 Press the alt key and click on an area near the purple fringing to choose an appropriate color to “paint over” the purple line. 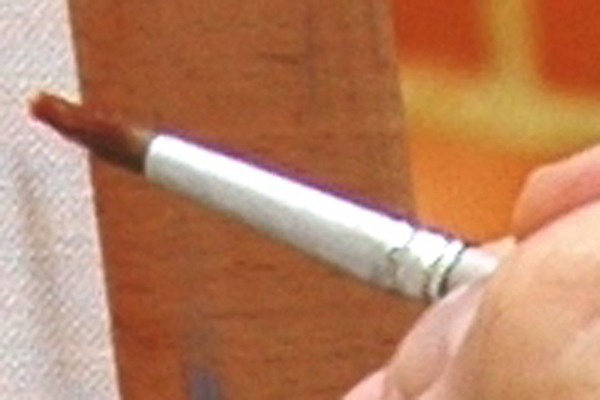 In this example I chose the brown just above the paint brush to start, then moved over to the orange and white. Once your color is chosen, simply paint over the purple line with the new color. Do this in small, precise steps. You’ll find it much easier to correct mistakes if you make a stroke or two then release the mouse before doing more strokes. When you need to “undo” a stroke you’ll lose less of your work (you’ll understand this more after you do it on your own a bit). This is my favorite way to remove color fringing. 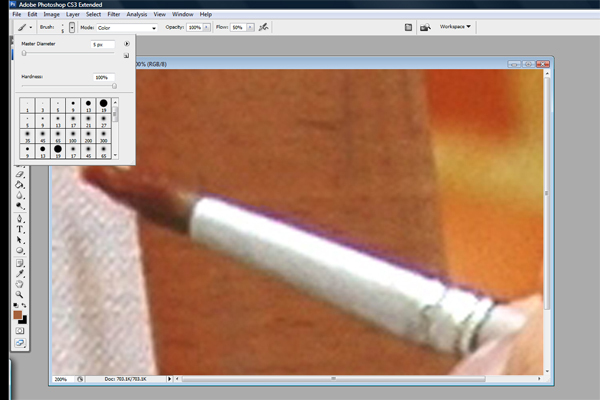 The only thing I do differently is to first create a create a new layer in the layers palette and switch it to color. Then I proceed as you have described so well here. If you do the edits on the new layer, then you are not destructively editing the original image. And you can also make changes to transparency, see exactly where you’ve painted by hiding the original layer, and make later changes to your edits. Sometimes automated and other manual methods work well, but sometimes they don’t. This method always works. Sure, it may be a bit time consuming…but perfection has its price.